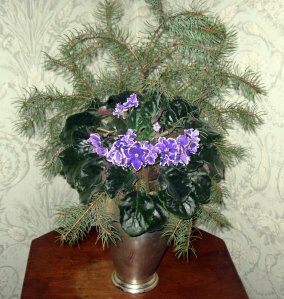 Here, purple, blue, and white African violets make a pleasant centerpiece in association with quince, blue spruce, pine, and yew. 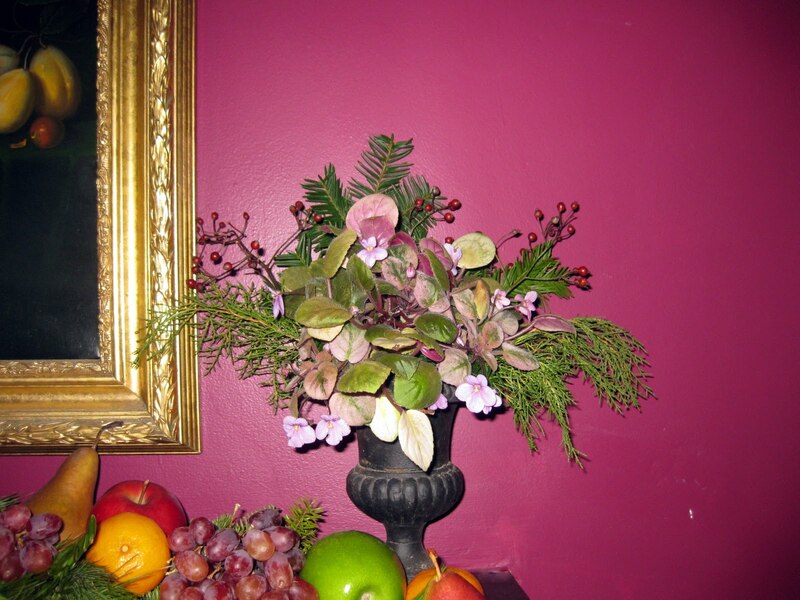 In a setting of wild, red rosehips and sprays of yew and pine, a pale-blue African violet makes a shimmering presence on the left end of the dining room mantel (above), while ‘Happy Trails,’ a pink, trailing variety (below), creates balance on the right. Saintpaulia ‘Special Treat,’ with huge, purple blossoms edged in white, makes a festive presence for my parlor. 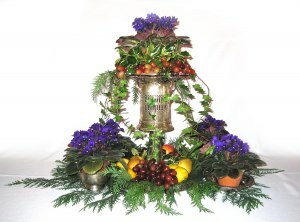 The plant’s small pot is hidden among pine branches inserted into a silver vase. Why limit your Christmas flowers to such temporary delights as red poinsettias? 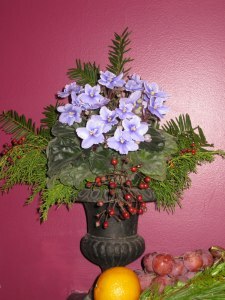 African violets shimmer not only during the holidays, but year ’round, too! Don’t miss a beat at A Garden for the House…sign up for Kevin’s weekly newsletter! Thunbergia Grandiflora "Blue Sky Flower"
Kevin, I grow lots of African violets under grow-lights in my basement. Maybe I should bring them upstairs, and put them to work! Your photographs are really inspiring! I love all of your arrangements, but especially the top one. So lucious, with the grapes and fruit! Kevin, I've been using the high phosphorous fertilizer you recommended, and boy is it working. My 8 standards are covered with flowers! Maybe I'll set them near the Christmas tree – where they will surely be noticed! Yolanda – I'm delighted that the plant food worked for you! I have never seen AVs displayed so beautifully. Thank you for sharing these! Wow, that top photo is incredible. Will you tell me how to plant things? Hi, Anna! Nice to hear from you! You can grow African violets very easily. Just click on the September archives. There, you will find an article called “African Violets: My Easy, Always-In-Bloom Program.” It will tell you almost everything you need to know. And, be sure to post often! 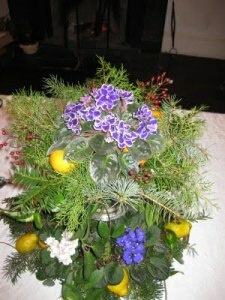 Montreal florist – thanks for stopping by. Glad you picked up a tip or two. Hope to see you here again! I am going to get some high phosphorous fertilizer and start some new plants according to your directions. Love this blog.. You give all the info that is useful in everyday life. Thanks so much. My pitiful African Violet , after following your instructions, is very healthy, happy and blooming profusely, with 3 sets of bud clusters to go!! Thank -you so much;-) I started 6 cuttings in January and will be patient. My next project- if I have the courage , is separation and re-potting. I have the desire to rescue from neglectful nurseries less fortunate African violets. Do I have the sickness? I have the trailing AV. I have been able to propagate many leaves and share it with friends. It grows runners and drapes of the pot. If the runners touches the soil it roots. Very easy to take care of. I had my original one get so big, I cut it into 3 pieces and it all of them did fine. Even a runner with no leaves, sent up new leaves.